U PENN GOALIE REED JUNKIN – LAXMEDALS.COM WEEK 2 NCAA MENS LACROSSE PLAYER OF THE WEEK. February 25, 2018. The Laxmedals.com Week 2 NCAA Division I Men’s Lacrosse Player of the week is University of Penn Goalie, Reed Junkin. Penn upended #1 Duke 10-9 at at Franklin Field. Junkin, a sophomore from Wayland, Mass. (Belmont Hill H.S.) held the team on a solid footing in the first half commanding the net while under a constant Duke offensive blitz. Reed is credited with making some spectacular game-changing saves to keep Penn alive until the Penn offense warmed up and took the game lead late in the 4th. Junkin and the Penn defense held the #1 Duke offense scoreless during a 9 minute stretch in the 4th to seal the win. Penn Lacrosse and Reed Junkin have the medal of a lacrosse champion! Each week Laxmedals.com will send the player of the week this trademarked Laxmedals medallion with game date and stats printed on reverse. laxmedalsLaxmedals.com NCAA men’s lacrosse player of the week Albany Freshman Attackman Tehoka Nanticoke. 5 goals in a brilliant start to his collegiate career! Tehoka has the medal of a lacrosse champion! Each week Laxmedals.com will send the player of the week this trademarked Laxmedals medallion with game date and stats printed on reverse. 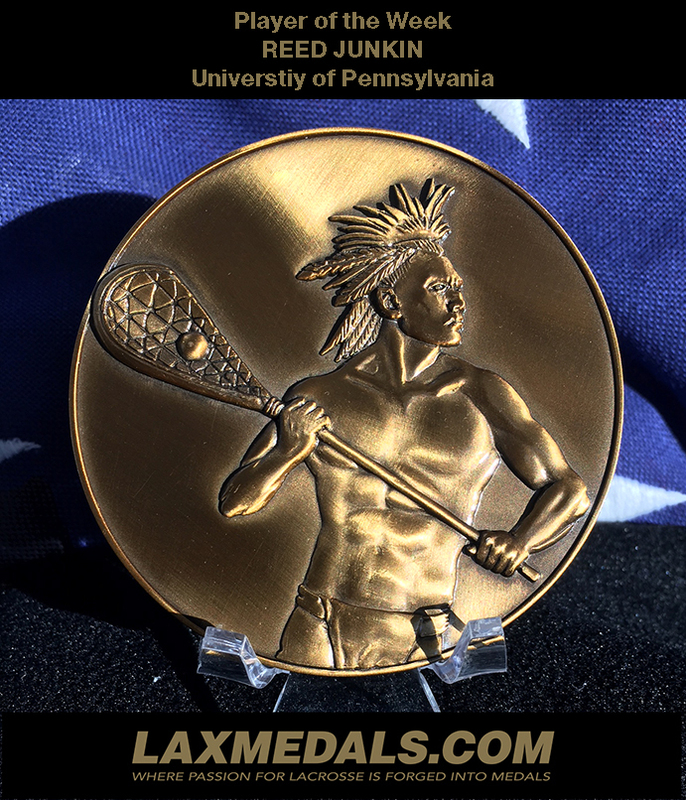 #laxmedals #albanylacrosse #lacrosse #ncaalacrosse #awards #tehokananticoke. Laxmedals.com not only makes the medals, but we make the rack to display your medals! Laxmedals.com custom designs your medal display rack to your exacting needs and offer many options on size, color, and the number of hanging bars included on the rack. Whether you need one or one thousand medal display racks, Laxmedals.com is your source for the highest quality racks at affordable prices. Shown above are three custom medal display racks in unpainted stainless steel. Below is a custom medal black powder coated display rack right from the Laxmedals.com lobby where we proudly display a few of our recent medal designs. For more information about the FIL CLICK HERE.